ECLIPSE will be demonstrating its unique loudspeaker technologies at Bristol. Throughout the three-day event, ECLIPSE visitors will be able to audition the exceptional sound quality of the TD510ZMK2 loudspeaker (£3,840) and the TD520SW subwoofer (£3,000), a proven combination capable of eclipsing ordinary, boxy loudspeakers. ECLIPSE’s senior team, joined by distributor Decent Audio’s sales team, (room 320, third floor) will be introducing the benefits of ECLIPSE’s approach to loudspeaker design and engineering, plus the sonic advantages of its many proprietary technologies. The team will also be on hand throughout the weekend to answer questions, offer advice and explain how ECLIPSE can effortlessly integrate into any audio system. The TD510ZMK2 (‘Z’ denoting the integrated ECLIPSE stand) offers many of the key design elements of the flagship, studio-proven TD712ZMK2, in a more compact and affordable package. 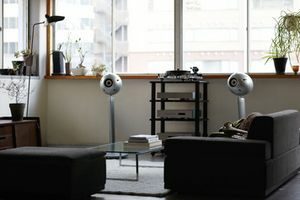 The speaker includes the full spectrum of ECLIPSE proprietary loudspeaker technologies, including the legendary egg-shaped cabinet, a 10cm custom full-range driver, plus several internal vibration-eliminating engineering solutions. The addition of the ECLIPSE-designed and engineered extruded die-cast aluminium stand, further eliminates unwanted vibrations and ensures tighter low frequencies. Its forward-slanting, streamlined form prevents the disturbance of air flow, plus the stand also benefits from extensive internal damping combined with high-density, kiln-dried sand-loading. Unusually for a high-end speaker, the stand also offers useful angle adjustments of -10–15 degrees, adding convenient flexibility to help suit the listening environment. Built with music reproduction in mind, ECLISPE’s TD520SW subwoofer has been designed to perfectly complement the company’s smaller loudspeakers, seamlessly augmenting the lower frequencies, whether playing music or video soundtracks. Its compact design allows for flexible placement and houses two 20cm back-to-back drive units which can be driven at high speed for unrivalled transient delivery and timing accuracy. A compact ICEpower-made high-output digital power amplifier is also employed, which allows for a smaller internal circuit, while keeping high linearity at maximum output. The TD520SW is equipped with two input systems, each provided with an independent audio volume and low-pass filter enabling flexibility in stereo or surround mode.